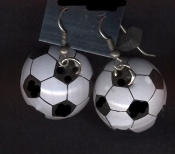 Big Dimensional Mini SOCCER BALL EARRINGS - Ref, Goalie, FutBol, Game, Team Mom, Coach Charm Jewelry - Detailed, miniature enameled metal 3-D hollow round sphere toy, approx. 7/8-inch (2.19cm) diameter. You'll get a real KICK out of these!